Jazz Shakuhachi with Bruce Huebner and Jonathon Katz. A dual language edition with optional Japanese subtitles. Jazz Shakuhachi is based on over six years of recording and performing that has yielded a body of composition and improvisation tailored to these two wildly disparate instruments, piano and shakuhachi. 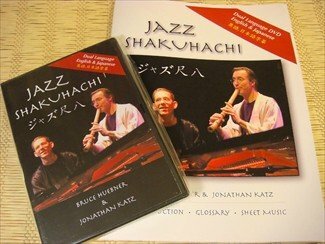 The Jazz Shakuhachi DVD comes with a 20-page booklet that includes an Introduction, Glossary and Sheet Music of all the pieces performed. V-20 Dual Language – English with Optional Japanese Subtitles. • Live stage clips filmed at STB 139, a club located in the Rippongi district of Tokyo, Japan. • Engaging discussion of strategies for blowing, writing and interpreting across the cultural divide. • Easy to understand examples from original tunes and folk songs. • Clear on-screen notation of scales and chord names. • Short improvisation exercises for play along or keyboard study. • Pedagogically-arranged chapter headings and menus. • Screen notation, chord names. • A printed glossary and sheet music. • A traditional shakuhachi veteran looking for ideas for a new musical outlet. • A western-trained musician, but shakuhachi beginner, hoping to exploit your chops in a new and creative way. • A composer or back-up player looking for hints on bringing out the best of this traditional instrument. • An educator introducing new trends in non-western music, aesthetic issues in modern fusion music or Japanese studies. • How can I begin enjoying improvising with only a rudimentary knowledge of the shakuhachi or with little or no jazz background? • How can I harmonize chords played on the piano with the open tones of the shakuhachi? • How is the shakuhachi uniquely built for the blues? • How are Japanese folk melodies ideal for Latin jazz? • How can I build a jazz solo or play over fast chord progressions on a 5-hole bamboo flute? • How can traditional scales apply to modern jazz chords?